Check Out Our Lightweight Travel Trailers! One of the more popular types of recreational vehicles is the lightweight travel trailer. These campers are built with strong but lighter weight materials to keep their tow weight down in order to put less strain on your vehicle while you are towing. Travel with ease in a lightweight travel trailer! Things like wind resistance and weight will contribute to how good of gas mileage you get, so by purchasing a lightweight travel trailer, you can save money while you travel. Plus, many of these models can be towed by a midsized SUV or a half ton truck, so there will be no need to purchase one of those large, expensive trucks to tow it. 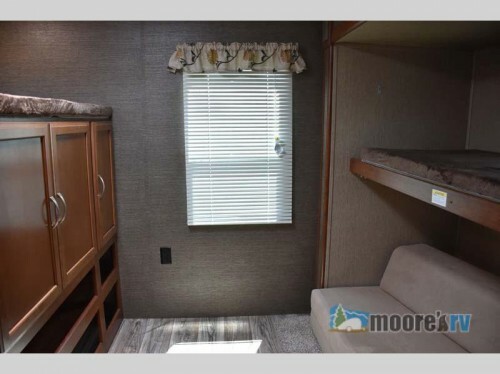 We, here at Moore’s RV, have both new and used options in our lightweight travel trailer models, and all of them will be listed at our bottom dollar prices. 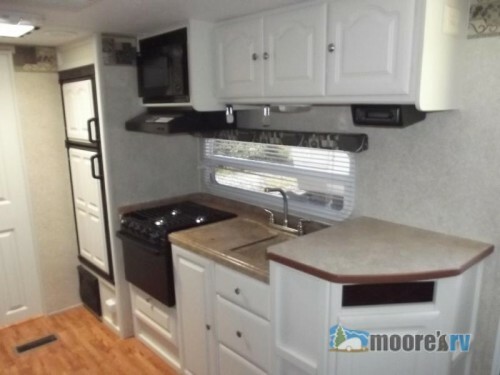 This way, you will not only get a functional RV, but you will be able to get it for a price you can afford. Save money and get more than enough space for everyone. 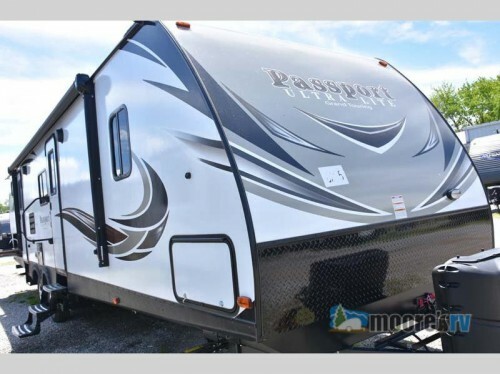 Like this new 2018 Keystone Passport 3350BH Grand Touring for example. We have priced it at $28,667 to offer you a savings of $8,578. 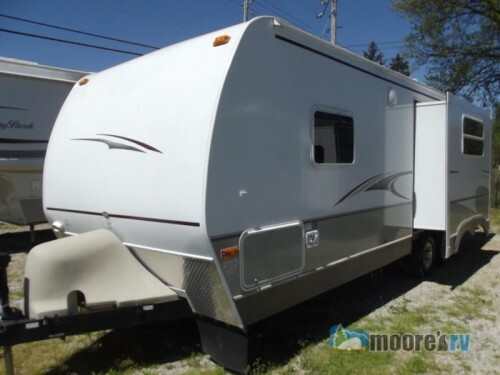 Get this two slide travel trailer with enough room to sleep up to nine people by having a full, separate bunkhouse as well as one and a half bathrooms! Even find used lightweight travel trailers! Or what about this used 2008 Keystone Outback 26RLS. The list price of $11,071 is incredibly affordable, and with the floorplan featuring one slide, you are sure to find room for everyone. Plus, cooking on at the campsite will be easy in the beautifully modern black and white kitchen complete with double door fridge, 3-burner range, and oven. Get a beautiful place to call home at an incredible price! If you want to get a camper that is easy on your wallet and your vehicle while towing, then a lightweight travel trailer is the right option for you. Contact us or come by our location today to check out all of our models and feel free to look at our other fifth wheels, motorhomes, toy haulers, and more!